Da oggi le stampe delle fatture escono su 2 pagine. Ieri uscivano correttamente su 1 pagina. On my task list for my team, we mostly have the same tasks every day, with a few added new ones. Right now, I have to go through the long list and revive all manually. (Also there seems to be a bug that means you CAN'T revive once you clicked on "show all completed tasks"). It would be awesome if I could just revive all. Or alternatively to set daily repeating tasks! Thank you! It would be great if I had the option to collapse (hide) it. be able to send task to following day or automatically carry them over if not done by midnight. Please add code tag for developers to mark text as code. Lots of people are using privately Todoist, Any.do and other "wonders" of productivity. I personally use both - Todoist and Any.do - but let's assume todoist is the more popular one. Is it technically possible to create a interface that would connect these two services - let's say throuhg a IFTTT API? And have a project in Todoist named flask.io, that would contain the "linked" flask.io lists. Part of what makes a checklist so useful is the sense of achievement when a task is complete.It should be an option of what you want but I personally love having the check mark stay there so it help me feel that I can complete everything else. Instead of adding new tasks to the top, add them to the bottom so they're in the order you're adding them. 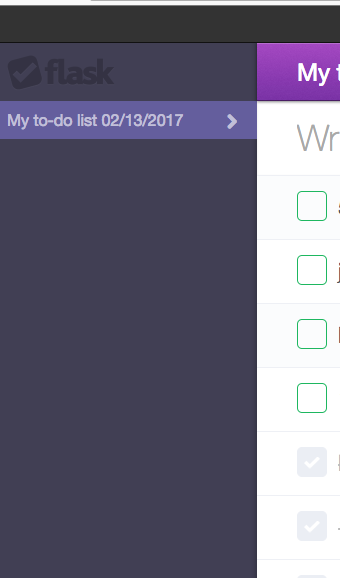 I use a billboard (Screenly) that rotates through websites and this task list is one of them. An option to adjust font size in the address would be a tremendous help is being able to read the list from afar.